Compañias de fracking llegan a un acuerdo para indemnizar con 750.000 $ por un caso de contaminación. Range Resources, MarkWest Energy y Williams Gas aceptaron indemnizar con $750,000 por un caso grave de contaminacion en el Condado de Washington , de acuerdo a recientes registros del juzgados aun no revelados. An order to unseal the records was entered Wednesday in Washington County Court of Common Pleas by President Judge Debbie O’Dell-Seneca. Judge O’Dell-Seneca reversed an earlier decision to permanently keep the more than 900 pages of court records secret. In the order she stated that the drilling company’s claims of privacy rights had no merit. 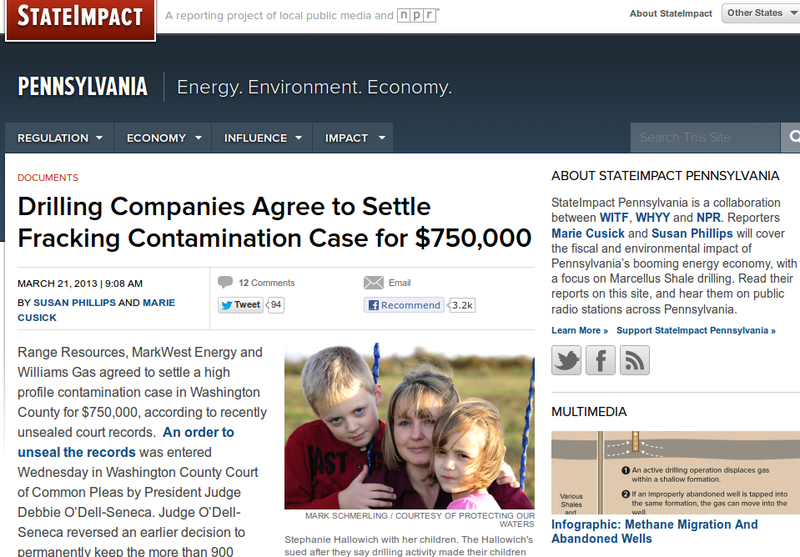 StateImpact Pennsylvania has obtained the newly available documents and we’ve posted all 971 pages below. The Hallowich family sued the gas drillers after they say nearby drilling activity, including compressor stations, made their children sick. The mother, Stephanie Hallowich became an outspoken critic of gas drilling in the Marcellus Shale. But the final settlement imposed a strict gag order on the Hallowich family, as well as the gas drilling companies. The Hallowich family has since moved from their home. Below are the 971 pages of documents unsealed by the Washington County Court of Common Pleas on Wednesday. To view notes, click on the text highlighted in yellow. ← Keiser report en español. El infierno de la fractura hidráulica.